FMC’s memory technology is based on a fundamental material discovery, i.e. the discovery of ferroelectric properties in hafnium oxide. 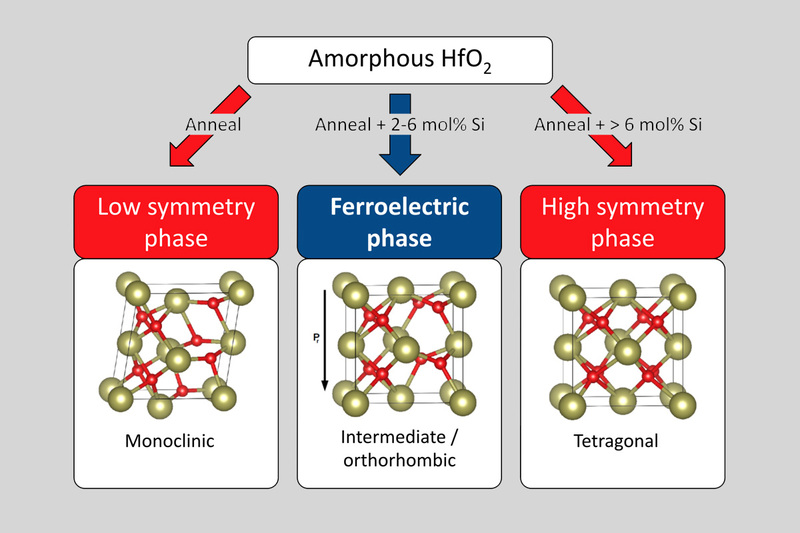 During the days in which HfO2 was researched as a DRAM capacitor dielectric, it was found that a previously unexpected crystal phase can be stabilized by doping and thermal treatment of the material. Within that crystal phase (an orthorhombic, non-centrosymmetric phase, see Fig. 1), the oxygen atoms of HfO2 can reside in two stable positions, shifting either up or down according to the polarity of an externally applied electric field. Therefore and depending on the position of the oxygen atoms, a permanent electric dipole is created that can either point upwards or downwards in this way enabling the storage of two binary states. Hence, it is a bulk memory effect that can be controlled by application of an electric field only. Due to the fact that the ferroelectric effect was so unexpected, the material was researched heavily during the last years in order to proof its potential as a memory material. The results of this research are given in Fig. 2. It has already been demonstrated that the material shows extreme temperature stability as well as endurance, retention and switching speed characteristics similar to classical ferroelectrics. However now with a ferroelectric material that is 100% CMOS compatible. Fig. 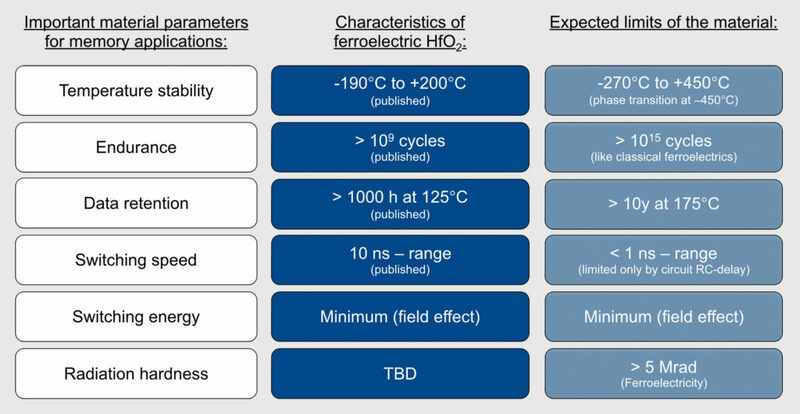 2: Memory properties of ferroelectric hafnium oxide as derived from experiments and expected material limits.